Holly Knitlightly: Bubble Gum day! Skippy Peanut Butter's birthday! Bubble Gum day! Skippy Peanut Butter's birthday! Today is also Skippy Peanut Butter's birthday! Haha my cousin Mikayla will LOVE this! She love love LOVES Skippy Chunky Peanut Butter, so last year for her birthday I got her a big jar of it! This is going to be a quick post, it has taken my AGES because my computer is super slow right now (because all of the snow? hahaha.) and I just want to get into bed & curl up! It has already started snowing like crazy and it's supposed to continue all night long! Keith is pumped because he's going out snowmobiling for the first time this year, and I don't mind because I LOVE the snow! I wouldn't mind if it snowed like crazy for the next few days! Haha. I'm going to go do some crocheting (I know! A change from knitting!) and watch some Monk before bed! Hope you guys all have a great (and warm!) night! If you go look at this post, you can see me standing in front of the infamous gum wall here in Seattle. I LOVE skippy peanut butter, crunchy. Holy, who knew you could find out so much about bubble gum! The first time I met my brother's (now) wife, she had bubble gum ice cream that turned her whole mouth blue...I will always think of her when I see bubble gum ice cream! 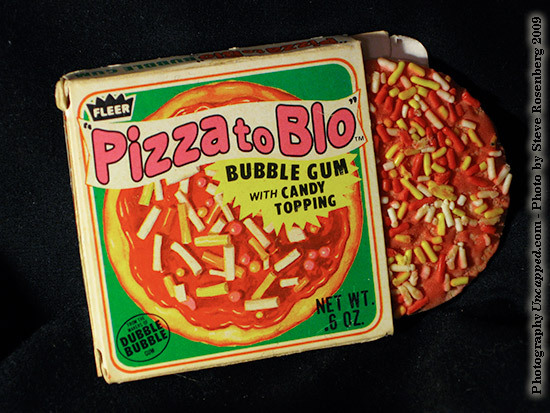 Is that really bologna bubble gum.... I seriously choked on my coffee when I saw that. Fantastic gum finds.